Today is the 236th anniversary of the promulgation of Dominus ac Redemptor, the papal bull of Pope Clement XIV (a Conventual Franciscan) suppressing the Society of Jesus (the Jesuits). In this bull the pope dissolved the Society without condemning it because it is said that he did revere many of its members. Hence, the suppression had nothing to do with enmity (Franciscans vs. Jesuits) as much as it had to do with the significant criticism the Society faced and the likely realization of the threat of Church schism if the pope didn't do something with the Jesuits. Faced with the pressure of a fragmented Church, Clement did what he had to do. By the time of this unusual papal intervention, the Jesuits were expelled from Brasil, Portugal, France, Spain and Parma. The Jesuit order was restored in 1814. An annual event at graduation time of the non-Jesuit students at Rome's Gregorian University is a wreathe laying ceremony at Pope Clement XIV's grave at the Basilica of the Twelve Apostles. There newly graduated students offer a prayer asking the pope to intercede before God to have the Jesuits suppressed once again. One wonders about the efficacy of Clement's ability to ask the Lord for a favor. I would like to invite everyone to enter into a period of intense time of prayer for the Church in the coming days. Use your discretion as to length but do some form of prayer the good of the Church. The Holy See has asked five bishops to investigate the life of the members of the Legion of Christ beginning on July 15th. May I recommend the prayers to the Holy Spirit is needed as well as the Memorare for this intention. The Legion of Christ is not everyone's "cup of tea" but they certainly are an influence in many sectors of ecclesial life. The Legion has challenged the "categories" of many but they have done some good for the Church under the guidance of the Holy Spirit. So, while I am not a supporter of the LC, I am not looking for anything but an honest review and coherent application of mercy. What affects them ought to affect all of us since we are bonded together in Baptism making us all brothers and sisters. Am I my brother's keeper? Yes, and we ought to show prayerful solicitude with the Holy See and the bishops doing the investigating. Many peoples' lives are in significant turmoil over the recent revelations of misconduct of Father Marcial Macial (the founder) and other distressful matters of internal governance and the misuse of spiritual authority. Today Sandro Magister published an interview with a prominent former Legionary priest, Father Thomas Berg. Consider reading it. Here in the greater Connecticut and New York area the Legion operates a novitiate, a juniorate, an institute of higher studies plus a variety of other initiatives, including but not limited to the National Catholic Register and recent acquisition of Southern Catholic University. In the US the press reports that there are 24 Legion of Christ houses with about 130 priests and more than 250 seminarians. It would be inappropriate to suggest what the Pope would or should do for the good of the Church and the Legionary congregation. Whatever it is that the members are asked to do by the Church, I predict it will be some tough medicine and I ask that all of us stand on the side of the angels. This is an opportunity for excessive criticism and unflattering talk. It is time for prayer and conversion of life. 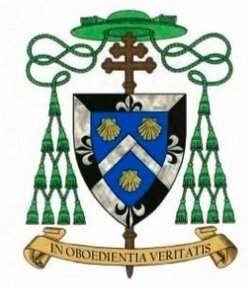 Today, a most beautiful DC day, with great joy and fanfare the Church ordained Father Joseph Augustine DiNoia, O.P., 66, a bishop. The setting was the beautiful Basilica of the National Shrine of the Immaculate Conception. The drama of the Liturgy couldn't come together in your theological imagination better than when you read the words in dome over the sanctuary which reads, in part: "Jesus has pored forth His Spirit you see and hear." Right, the Lord poured forth his Spirit upon Father Augustine ordaining him a bishop. 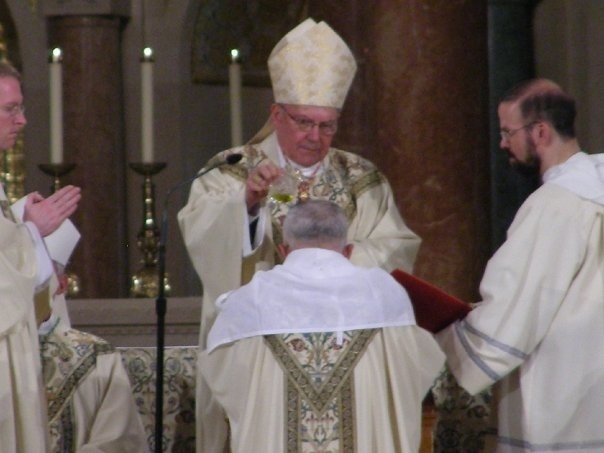 He was appointed by the Holy Father the titular archbishop of Oregon City. 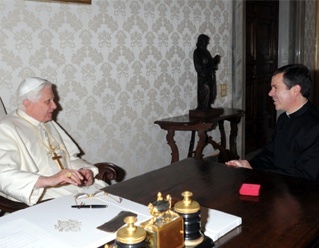 Even more to the point, he's the archbishop secretary of the Congregation for Divine Worship and the Discipline of the Sacraments; this office is part of the Roman Curia so Archbishop DiNoia works for the Pope. 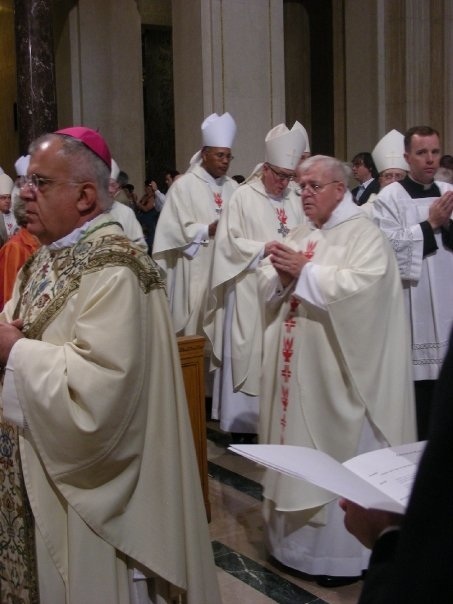 William Cardinal Levada was the consecrating prelate with the assistance of Archbishop Thomas Cajetan Kelly, OP and Archbishop Donald W. Wuerl. 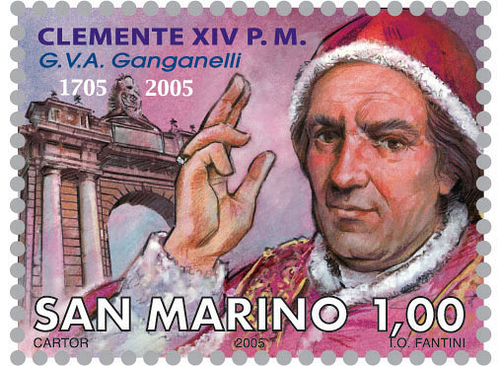 Antonio Cardinal Cañizares Llovera was supposed to be here but he forgot his passport at home and didn't have time to run back to the Vatican to get it and make the flight. Easily 250 priests and a handful of bishops including three other cardinals. The image to the right is of Fra Angelico's Coronation of the Virgin (at the Convent of San Marco) was used for the invitation, worship aid and remembrance card. Talk about theology and Liturgy! When the Papal Bull was read by the Dominican Provincial Father Dominic Izzo you heard the Pope say of DiNoia: you are a beloved son, suitable for the office of bishop because you manifest gifts of mind and heart, piety, diligence, experience and prudence; you are now asked by the Church to use these gifts for the up-building of the Church through the work of Liturgy and the sacraments. In the context of the Eucharist, family, friends, colleagues (past and present) and others who thought it best to attend, gathered to pray for the Spirit to come down upon Father Augustine so that he receive the gift of the fullness of Order, i.e., a bishop. We were reminded by Cardinal Levada that following ancient belief and practice the mission given to the apostles through Holy Spirit and imposition of hands the Tradition is preserved until today. The action of the Holy Spirit and the Church Father Augustine was conformed to the three-fold work of Christ as teacher, shepherd and priest not for himself but to join with Saint Peter and the apostles, Pope Benedict and the entire college of bishops in communion with the pope. Therefore, the doctrine is that a real "communio" exists with Augustine and the Pope and with every bishop in the world. So our Catholic belief here is that Father Augustine lives as Christ's vicar because of his episcopal character having particular care and solicitude for all the Church. The notion of episcopal solicitude means that a bishop builds up the body of Christ not only at the local level but worldwide. How is this done? Going back to the point of calling on the Spirit to come down upon the person to be ordained and the anointing with oil. Delving deeper into this dramatic Liturgy we notice that the Church invokes the Trinity, the saints and angles to come upon Father Augustine who abandons himself to Christ in humility in an act of humility seen in his prostration before the altar. Moments later the cardinal imposed hands (with the other bishops) and poured oil on the head and gave the visible ornaments of the bishop's office (ring, mitre and crosier). Capping the ritual off was the seating of the bishop and the sign of peace. BUT, I think we need to reflect on the cardinal's words when said we are all to look to the "destiny of divine embrace" as all of heaven gazes down upon Augustine. Here we realize the promises of Christ. 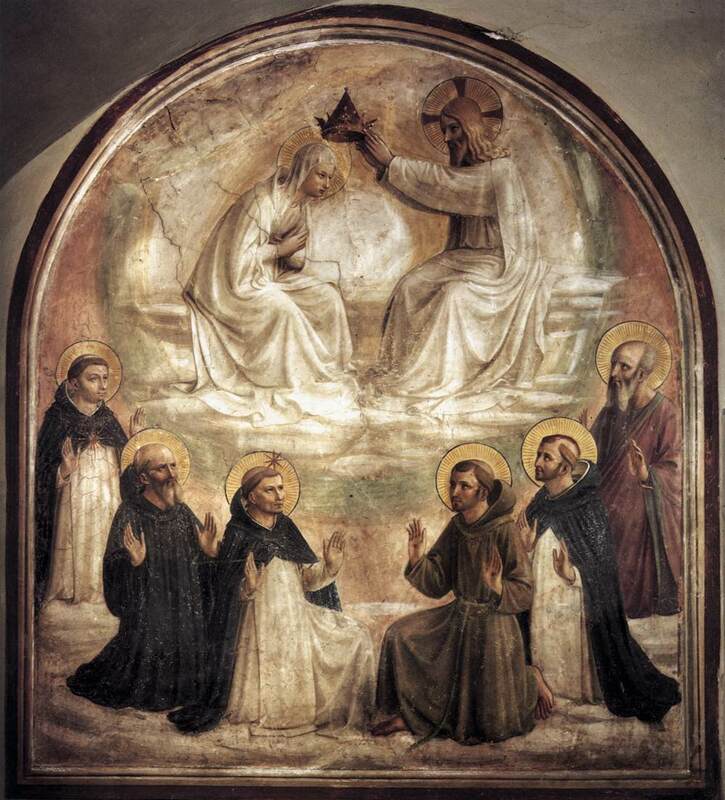 And to that, the saints and angels lift Augustine's gaze heavenward while the Trinity gives the grace to preach the gospel with constancy and faithfully. Cardinal Levada reminded us of the tall order DiNoia was called to: to live and teach Gospel in truth. As a point in history he renews his commitment to the truth of Gospel. Remember: truth is not a thing but a Person. Truth, you will recall, makes us free for the service of Christ oriented toward the liberation of the world. A nice point of continuity with Dominican history is that Archbishop DiNoia used the crosier of Father Benedict Edward Fenwick, OP, founder of the Dominican Province of Saint Joseph and bishop of Cincinnati. Other points of continuity were the presence of the archbishop's chaplains Dominican Fathers Gabriel B. O'Donnell (JAD's ordination classmate & my spiritual father) and Romanus Cessario. One can't overlook all of the Dominican family and friends who travelled long distances to support him. Finally, the whole ecclesial event was a wonderful grace for Archbishop DiNoia and in that my own friendships were renewed by seeing so many very friends, plus making new ones. This page is a archive of entries in the Holy See category from July 2009. 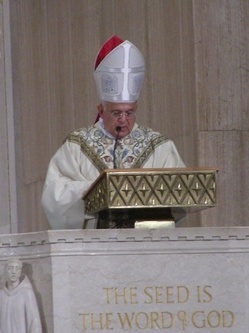 Holy See: June 2009 is the previous archive. Holy See: August 2009 is the next archive.